Temenos is a simple, light-weight way to discover where we are less authentic than we think we are or want to be. It’s based on the mental model behind many human healing techniques: that pain and stress are caused by giving up authenticity in favour of attachment, fulfilling expectations which are not our own, in order to be loved. In contrast to therapy, Temenos leverages the basic human abilities of story telling and compassionate listening to tap into the innate healing powers of compassionate human beings. Temenos is method-free and bears few risks and side-effects: it just helps us to discover how we became who we are, discern which of our habits and expectations are our own and which are not, and offers us a choice: which of these to keep and which to let go. Then, we are allowed to see who we truly are, and how we want to be. For a team, this is the most effective and powerful way I know to create a shared vision. The first part of a Temenos lab lets us look at our individual pasts. We reflect on our biography and focus on influences which shaped us – events, actions and fellow beings that made us who we are. The lab continues with Clean Slate. In the course of our lives, we frequently trade authenticity for attachment. We behave in certain ways to increase our chances to be seen, be liked, be loved. We develop strategies that help us be successful, or simply allow us to survive. We hide our true selves behind a persona. Key influences to consider when drawing your influence map are people and events which at the time invited or lured us to become more or less authentic. someone allowed you to be who you truly are, invited you to disclose yourself, to be more open and authentic than your usual public self at the time. someone set an expectation or an example (or you interpreted their behaviour or the context in that way) that led you to slip into a certain role, display a specific behaviour, to make you successful or help you survive. It may have felt wrong at the time, and it was the best you could do. Depending on whom you intend to share your story with, focus on influences that are relevant for the group and stories that you are willing to share. What’s important to you, here and now, in this group? What do you think you need our help with? Drawing and sharing your influence map allows you to look at key influences in your biography. The group you’re telling your story to will listen compassionately and allow you to experience that you’re not alone. Some of them might resonate with some of your stories: We all share the same journey, we just take different paths. Every human being struggles to find their role in life. Be it gender, job, class, belief system – none of us picks a life context where our authentic self completely fits in. And it seems dangerous to stand out, as we have a desperate need to belong. All of us are afraid, to a greater or lesser extent, to disclose our true self in front of others, since they might stop liking us. A second universal truth about all human beings is that our levels of emotion are the same, even if the “objective size” of the cause is incomparable. We individually develop a sense of amount of pain when we adapt to our environment. Our internal scale of feeling mad, sad, glad or afraid is anchored by the greatest trigger, loss, joy, and fear, that we have personally experienced. Subjectively, no biography is better or worse than any other. If the biggest loss of my life was forgetting my teddy bear on a train when I was five, I’ll re-experience that level of sadness when another human being tells me their story of how they lost their child. There is no difference. And it’s not the same. We’re not alone, and we all feel mad, sad, glad, and afraid in the very same way. We’re human beings, we’ve evolved that way. Focus on a topic, a frame. This may well be “all of my life”. It may be “my work career so far” if the group you’re sharing with is your work team. It may be “Money and why I’m afraid of it” or “Where does my inability to set and keep boundaries come from?” if that’s a topic you’re currently interested in or struggling with. Introspect. Remember. Visualise people and events. Re-visit how you felt: what was going on in your body, your mind, your soul at that moment in time? Visualise. 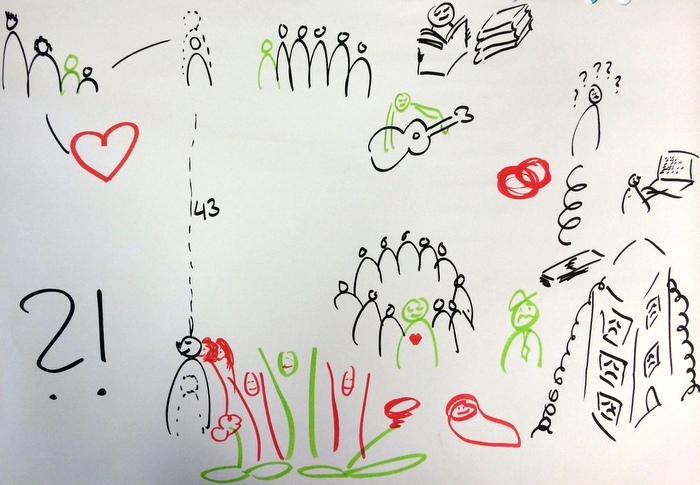 Decide how to draw the events and people on your paper. This is not about creating art – drawing taps into your right brain, increasing the resources you bring into this exercise. Your picture will help people follow your story just as fine when you do kindergarten-style drawing. I’ve heard stories that moved me to tears using a blank page. There’s no way you can do this wrong. Articulate. Tell your story to someone you trust. Share with the group. Ask your audience to compassionately listen. Don’t let yourself be limited by your drawing. If you’re inspired (by the stories of others or by their questions) to tell something completely different, that’s good. Follow your guts. Be open to let them share their perspective. Take their stories and questions as options to look at your story differently. Learn. Be curious to discover and learn aspects of your self you haven’t had a chance to (or didn’t dare to) look at yet. Influence maps is a safe exercise, given that no one in the group has the intention to do harm. There are two safety measures implicitly built into the exercise: In a group of people respecting each other, telling these stories creates the level of trust that’s needed. And people share according to their personal sense of safety in the group. Some people may feel embarrassed by the stories they hear, and may feel encouraged to go deeper than they intended before they entered the Temenos. That’s ok. At every moment, the person who shares is in conscious control of what and how much they share. If you host this exercise for a group, make sure that everyone participates voluntarily, and that it’s ok for every participant to check out if they want to. Influence maps are safe as long as you (the host) are authentic, open and compassionate. Encourage others to do the same. If you feel nervous, say so and ask the group for help. That way you help the group feel safe. Check in before you start. Invite every one to check in too, expressing how they feel. You may need to deal with your participants feeling and expressing pain. You open a safe space for them to be vulnerable, they trust you that they won’t get hurt. As long as you stay being compassionate and open, everything will be ok.
Use compassionate listening and explicitly ask your participants to do that too. For a full Temenos, the next step will be Clean Slate..